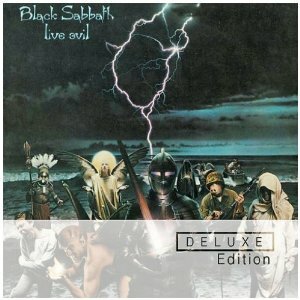 Live Evil is a controversial Black Sabbath live album because it features Ronnie James Dio rather than the iconic Ozzy Osborne. It also has Carmen Appice rather than Bill Ward on drums. I’m sceptical about this album and as I admitted in my review of Reunion, I’m not a huge Black Sabbath fan. While the Dio version of Black Sabbath has its attractions and he is a great vocalist, it requires an open mind to listen to the early classic heavy metal songs without Ozzy. Classic Rock magazine rated this as the 19th best live album ever – see great live album lists. What Do You Think About Black Sabbath Live Evil? Ronnie James Dio was such a distinctive singer that I can imagine he attracts people to this album who aren’t normally fans of Black Sabbath. To recognise his contribution to rock with Sabbath, Rainbow and his own band Dio, I have created his own specialist poll. If you like Black Sabbath I think you’ll like AC/DC, Blue Oyster Cult, Deep Purple, Rush and Thin Lizzy. This entry was posted in 1980s Live Albums, Heavy Metal Live Albums and tagged 1980s hard rock, 1982 live albums, Black Sabbath Live Albums, heavy metal 1982 by Paul Simister. Bookmark the permalink.